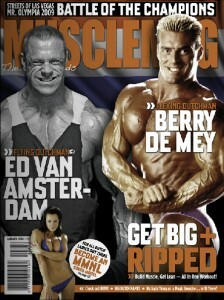 In January 2009, William began writing for MUSCLEMAG Netherlands. His column, All Things Anabolic, is typically in Q&A format, and discusses both pharmaceuticals and natural dietary supplements that are used to enhance performance and body image. The following is a summary of his writing for the magazine. January 2010 – William answers questions posed by MUSCLEMAG Netherlands staff about his recent book, the Sport Supplement Reference Guide. Interview touches on many industry-inside issues, and reviews some of the more effective natural supplements for athletes/bodybuilders. October 2009 – William takes a break from the normal Q&A format to introduce readers to X-Factor Advanced, the new arachidonic acid supplement from Molecular Nutrition. Arachidonic acid is arguably the most effective natural supplement for helping to increase muscle mass in bodybuilders. July 2009 – William answers questions from readers relating to Agoviron Depot (testosterone isobutyrate) from the Slovak Republic, Lipid Stabil and cholesterol levels on-cycle, switching esters mid-cycle, and steroid selection for a first-time user. April 2009 – All Things Anabolic reports on William’s recent trip to Europe to visit an underground steroid-manufacturing lab. Also answers questions pertaining to growth hormone use and cancer, anabolic steroids and the immune system, and injection site pain related to the use of underground steroids. January 2009 – William answers questions pertaining to the value of testosterone propionate as a bodybuilding drug, post-cycle therapy for testosterone recovery, and on-cycle health support supplements.